Hagan Fine Art is celebrating two amazing artists for the month of October. We invite you to join us from 5pm to 8pm for the October Artwork on Friday, October 5th, 2018. Double Feature: The Art of Adrian Chu Redmond & Noah Desmond presents two unique shows of two unique artists. Adrian Chu Redmond presents a collection of… collections. Clusters of oysters, crabs and fish delight the sense just in time for the season of Lowcountry boils and oyster roasts. Dreamy alleys of moss-covered oaks drift you into a timelessness you never want to leave. A collection of paintings featuring playful coastal birds and beautiful swimming koi delightfully complete Adrian’s selection from her easel. Noah Desmond’s colorful florals drawn you into a variety of worlds. His interior still lifes are light and airy, giving a peaceful setting to relax in. 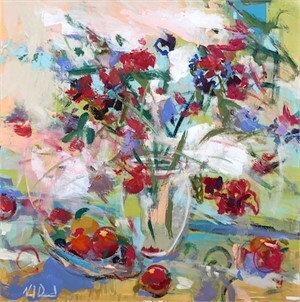 His garden florals depict vivid red flowers dancing in tones of the Southwest, where he presently lives. Noah’s landscapes are serene and vast, drawing you in to walk through the fields to distant forests. Double Feature will be on display at Hagan Fine Art at 177 King Street from, Monday, October 1st to, Sunday, October 28th, 2018. Pre-Sales available by contacting us at 843-901-8124 or by email at Info@HaganFineArt.com. 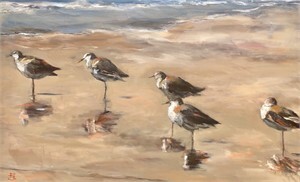 Adrian Chu Redmond is following her passion through her love of painting. Understanding the concepts behind the forces of abstract and realist art, she effortlessly creates a unique style by making her subjects appear larger than life. Inspired by the colors in nature, light references, patterns and texture, she utilizes bold strokes, strong palette knife markings and vivid hues to characterize her work. Adrian received a Bachelor's degree in the Carroll School of Management from Boston College. Prior to becoming an artist, she held a career selling national radio time to advertising agencies in New York City. Originally from New York, the mother of three resides with her husband, Michael, in Charlotte, NC. Hagan Fine Art is celebrating two amazing artists for the month of October. We invite you to join us from 5pm to 8pm for the October Artwork on Friday, October 5th, 2018. Double Feature: The Art of Adrian Chu Redmond & Noah Desmond presents two unique shows of two unique artists. “When we invited each artist to be featured for the month of October, we asked them what they would like to paint. They each had their own subject in mind. So, as we always said to our artists ‘paint what you want to paint.’ They are vastly different, but both oh so wonderful.” – Allison Hull, Gallery Director of Hagan Fine Art Adrian Chu Redmond presents a collection of… collections. 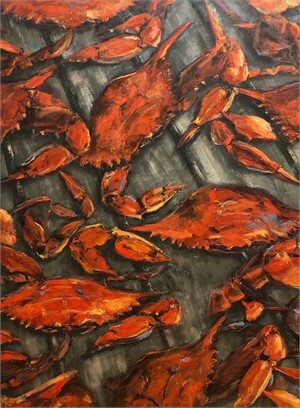 Clusters of oysters, crabs and fish delight the sense just in time for the season of Lowcountry boils and oyster roasts. Dreamy alleys of moss-covered oaks drift you into a timelessness you never want to leave. A collection of paintings featuring playful coastal birds and beautiful swimming koi delightfully complete Adrian’s selection from her easel. 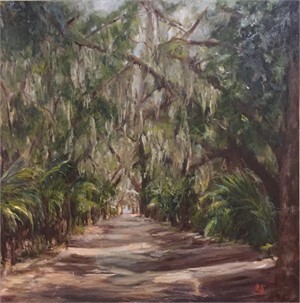 "Autumn is my favorite time of year in the low country with the cooling temperatures and the brilliant sunlight washing a wonderful warm palette over everything it touches. It is an honor to celebrate my favorite season as a featured artist at Hagan Fine Art and to paint what inspires me from within. It is with enthusiasm and joy that I share this collection with the hope that autumn in the low country will become special for you as well." --Adrian Chu Redmond Noah Desmond’s colorful florals drawn you into a variety of worlds. His interior still lifes are light and airy, giving a peaceful setting to relax in. 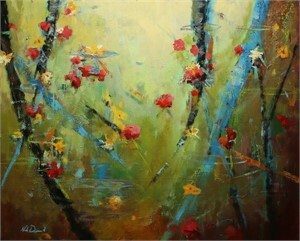 His garden florals depict vivid red flowers dancing in tones of the Southwest, where he presently lives. Noah’s landscapes are serene and vast, drawing you in to walk through the fields to distant forests. Double Feature will be on display at Hagan Fine Art at 177 King Street from, Monday, October 1st to, Sunday, October 28th, 2018. Pre-Sales available by contacting us at 843-901-8124 or by email at Info@HaganFineArt.com. Adrian Chu Redmond Adrian Chu Redmond is following her passion through her love of painting. Understanding the concepts behind the forces of abstract and realist art, she effortlessly creates a unique style by making her subjects appear larger than life. 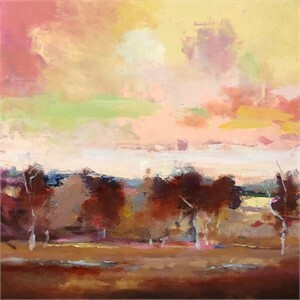 Inspired by the colors in nature, light references, patterns and texture, she utilizes bold strokes, strong palette knife markings and vivid hues to characterize her work. Adrian received a Bachelor's degree in the Carroll School of Management from Boston College. Prior to becoming an artist, she held a career selling national radio time to advertising agencies in New York City. Originally from New York, the mother of three resides with her husband, Michael, in Charlotte, NC. 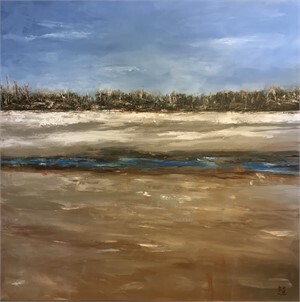 Noah Desmond Inspired by nature, Noah's paintings sit at the edge of abstraction by creating landscapes with bold colors and a sense of movement that draw you deep into the work. His energetic compositions are rendered with vibrant color, vitality, and spontaneity. Noah's heavily textured canvases are created by layering pigments with both palette knife and brush, resulting in exciting landscapes rich in depth and vibrancy. After graduating from Milwaukee Institute of Art and Design, and receiving a BFA, Noah attended Chicago Institute of Decorative Finishing, and School of the Museum of Fine Arts. 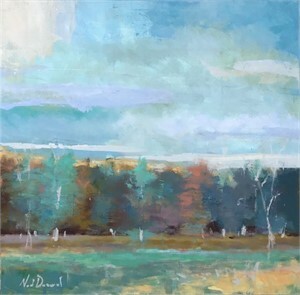 Noah Desmond has won many regional awards and scholarships, such as the Milwaukee Institute of Art and Design Merit Scholarship and the Blatz Foundation Scholarship. He is recognized for his painterly approach and freshness to his work, earning him a place in corporate as well as private collections.